Nollywood Producers Guild USA (NPG,USA) is an association of like-minded Film Producers who represent, promote and protect the interests of Nollywood/African Film Producers in film, television and news media in the United States and other parts of the African Diaspora. NPG, USA members work together towards laying foundations and building bridges for African filmmaking, to ease the challenges of filmmaking, improve content quality, and foster a conducive and rewarding workplace. NPG, USA seeks to avail growing filmmakers with the protection of such content related laws and rights such as copyright laws, intellectual property rights, and labor laws, while working towards creating a fair and rewarding content distribution structure that benefits both the producers and the cast and crew members involved in filmmaking. 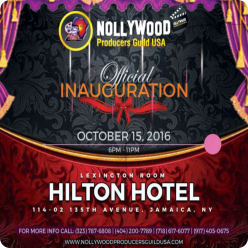 Nollywood Producers Guild USA is particularly focused on promoting the general welfare and improvement of excellence of the Industry through the creation of a secure distribution structure for fair and efficient content distribution. NPG USA hosts important industry events including Film Screenings, Conferences, Filmmakers Galas, and Awards/Recognition programs. To work with other Guilds, studios, networks and companies to promote the general welfare of the Industry and seek a harmonious resolution to issues of contention through our events, outreach programs, library and archive. The Guild will educate and inspire as well as promote and preserve the excellence within the Industry.